We’ll show you how the young professionals at Refreshing Designs along with the team at Lakes Country Landscaping have transformed this home into what it is today: breathtakingly beautiful, inside and out. When Aaron Karvonen first saw this home on a golf course in Perham, MN, it needed a little TLC. This now handsome exterior was once butter-yellow with brass fixtures. We’ll show you how the young professionals at Refreshing Designs along with the team at Lakes Country Landscaping have transformed this home into what it is today: breathtakingly beautiful, inside and out. 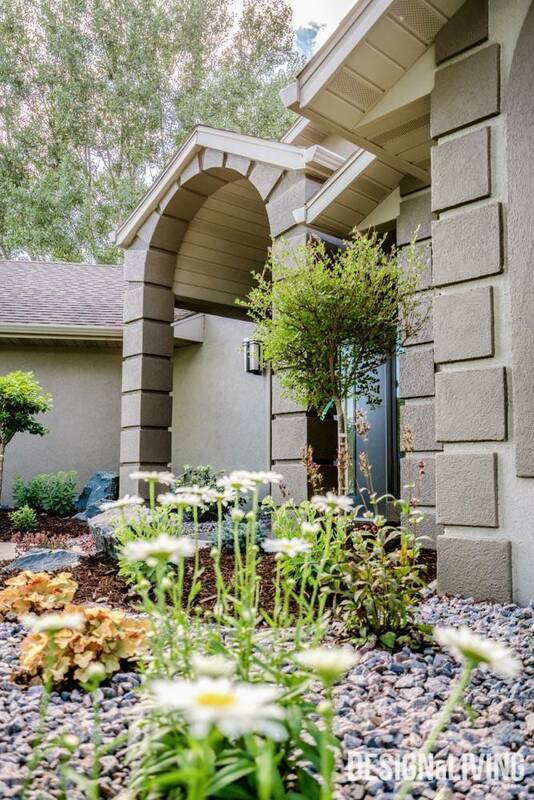 Karvonen consulted Shayla Hunstad and Bailee Schissel of Refreshing Designs when updating the paint color and fixtures for the exterior of his first home. Then, he relied on Chris Mensing of Lakes Country Landscaping to reinvent and rejuvenate the hardscaping and softscaping surrounding the home. Left to right: lead interior designer, Shayla Hunstad; interior designer, Bailee Schissel; homeowner, Aaron Karvonen; landscape architect, Chris Mensing. Schissel would describe Karvonen’s style as “modern-contemporary,” which the original butter-yellow paint color definitely did not reflect. Because the home was undergoing so many interior cosmetic updates, they decided not to keep things simple with the exterior by simply selecting a new exterior paint color and updating fixtures. Hunstad and Schissel had to come up with an exterior paint color that would complement the preexisting brown shingles, but not stand out too much from the palette used on the interior of the home. “When you’re painting something like the exterior of the home, you want to make the right decision,” Schissel said. In the end, they went with not one, but two cool shades of brown to accentuate the home’s architectural stucco details. In addition to painting the exterior, Hunstad and Schissel removed all of the brass fixtures and replaced them with modern-looking ones with straight, black lines. “We didn’t want to let those brown tones totally rule,” Schissel explained. The black accents also tie into the high-contrast color palette used on the interior of the home. They also installed new garage doors, which give the exterior an even more modern feel. Refreshing Designs often collaborates with Lakes Country Landscaping, and Karvonen’s home was no exception. Lakes Country Landscaping is owned by Chris and Shelly Mensing, and Chris Mensing was the landscape architect on this project. Decorative boulders help break up the straight lines on the exterior of Karvonen’s home with their organic shapes. His goal for the project was simple. “This house has a lot of lines, so we wanted to soften those up and make the landscaping fit the house,” Mensing said. To do so, he used curved edging around the softscaping, or flower beds, to form fluid lines around the exterior of the house. He also used used low-maintenance, flowering perennials such as hastas, hydrangeas and coral bells to help soften up the exterior. For both the softscaping and hardscaping, they used modern-looking pavers and dark, Dresser Trap stone throughout the landscaping, which ties in nicely with the color palette used on the interior of the home. The firepit in Karvonen’s backyard has a fantastic view of the golf course. Mensing installed modern, stone markers at the foot of the driveway.